Ethanol is a renewable, domestically produced alcohol fuel made from plant materials, such as corn, sugar cane, or grasses. Using ethanol we can reduce oil dependence and greenhouse gas emissions. Ethanol fuel used in the U.S. has increased dramatically from about 1.7 billion gallons in 2001 to about 13.4 billion in 2014. E10 is now the standard replacement for traditional unleaded. Over 90% of all unleaded sold today contains ethanol. 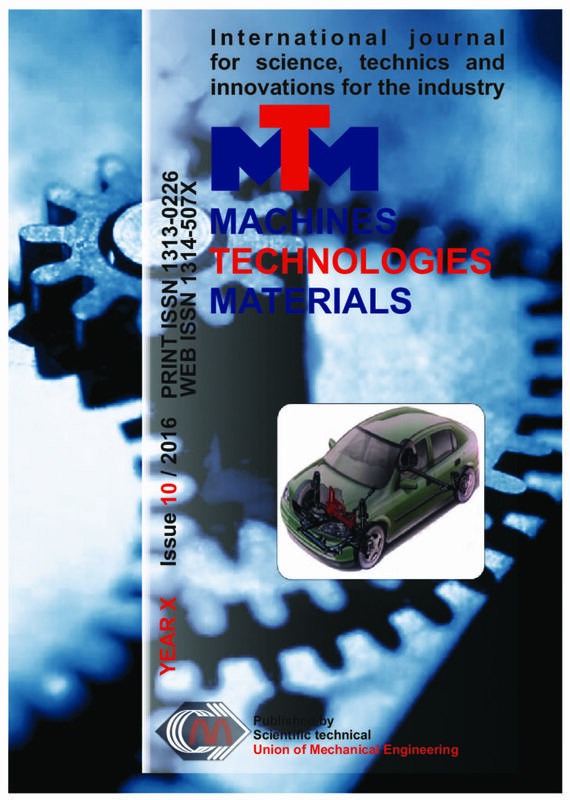 In this paper it has been examined the influence of the E10 fuel mixure on some car engine performance. In the report will be presented the investigation results of the working model of rotors with variable geometry parameters in dynamics. Because of aerodynamic and economic calculations, the effectiveness of use of such designs for powerful wind stations is proved. The analysis of various designs and methods of selection of that or other design for various conditions of operation of wind installations in wide range of the wind speed change is given. Also rather effective by cost-price method of accumulation of wind energy will be suggested that is the topical world problem and for development of which are annually spent some hundreds of millions of US Dollars. Training and examination of working professions employees (further – workers) of the organisations, that are controled by Federal department of ecological, technological and nuclear supervision in Russian Federation (further – Rostechnadzor) of occupational Safety and Health and in the field of safety – it is one of the key factors in creating conditions for trouble-free operation of hazardous production facilities (further – HPF) and reduce industrial injuries at these facilities. This article provides an overview of the existing system of training and examination of workers on occupational health and safety and industrial safety, revealed its main gaps. The development and implementation of guidance cards safe methods and techniques of work are revealed, as a form of industrial instructions. The key issue to an automotive engine’s reliability and its durability is the quality of the lubrication system. The primary task of the lubrication system is to provide a continuous supply of filtered oil between two sliding surfaces. By using adequate lubrication oils will reducing friction between moving mechanical parts. Rheological characteristics of lubricating oil directly caused the friction losses due to internal engines mechanisms (piston group, valve train, fuel pump, crankshaft, bearings and seals, etc.). The main components of lubrication system has a poor lubrication during cold start up process of an IC diesel engine and thus is necessary a proper lubricating oil to full fit the complex demands of all engine components and subassemblies. The aim of this paper is experimental investigating of the influence for different classes lubricating oils characteristics and oil filters which are present in market of Republic of Kosovo, especially those with lower prices on engine oil pressure, temperature and flow during start up until the oil warms up some. The obtained results are taken from measuring device which is installed into Fiat passenger car with Spark Ignition Engine for different working regimes. In the paper we solve the problem of transporting viscous weakly compressible liquid through the pipeline of the circular cross-section under non-stationary conditions. This paper is based on previous author’s results, presented on WS of XIII MTM Congress. The Navier-Stokes equations are the basis for mathematical model. The liquid kinematic viscosity and its density are considered to be weakly changing with time. The non-stationarity is caused by specific boundary conditions, depending on time. The obtained results allow to optimize the control of a viscous weakly compressible liquid flows in the pipeline systems. In the paper is investigated the possible to produce briquettes from chips of aluminum alloy and iron powder. Chips of different shapes and sizes are compared, some of which are free of water and oil (cleaned chips), while the rest are left without cleaning (soiled chips). Upsetting and reverse extrusion of the briquettes were studded. The results show that may be accomplished a large extent of deformation of the briquettes when using processes with predominant compressive stresses. Preparation of briquettes of metal chips with good density and quality is of great importance for the efficiency of this process. The results of impact briquetting of grey cast iron chips with rectangular shape and dimensions 15x25x1 mm are presented. Density and quality of briquettes of these chips are compared with those obtained in another work of the authors using cast iron chips with smaller sizes. It has been found that by using a rectangular chips with a large size are produced briquettes with a very low density and poor quality. Clarified have been the formulations of fracture mechanics (FM) included in the present applied standards for welded structures (Eurocode 3, ЕN 13445, EN 13480). Considered have been the main criteria of fracture mechanics for analytical assessment of structural integrity against brittle fracture of the elastic-plastic materials, while special space has been devoted to the concepts of the “FAD” and the “Master-curve”. The opportunity has been shown to use the conventional toughness criterion, shock toughness as per Charpy-V, by means of correlation relationships with the FM criteria. The article presents the results of research in improving the reliability of the vibration-based diagnostics test results of industrial equipment. It is possible to achieve such results through the modernization of the expert system by applying the theory of identification measurement signals. It is proposed the conversion of vibration signals into the table clusters of standard names with known distribution laws. The technique of intelligent processing of vibration signals and measurable technology to create a special database connection clusters of quantitative and qualitative evaluation of a diagnostic condition of the equipment are considered in the article. ELECTRIC-WELDED STRAIGHT-LINE-SEAM PIPES OF HIGH STRENGTH FOR UNIQUE BUILDING CONSTRUCTIONS. It was examined the developing of Specifications for high durability and large diameter electric welded straight -seam pipes used in unique constructions including that they worked in heavy climate conditions. It was demonstrated that the pipes, made with high cleaned from harmful admixture thick sheets treated by thermo mechanical rolling and accelerated cooling, possess very high cold-resistant, crack-resistant, fire-resistant and high resistant against propagation of fatigued cracks. It was installed that such pipes possess high resistant against mechanical aging and they have high level of parameters defined the resistant against the seismic loadings. In accordance with the results of researches there were developed Specifications with the suitable guarantee provided operational reliability of unique constructions made with electric straight- seam pipes. The paper describes the metrological activity in D.I. Mendeleev Institute for Metrology (St.-Petersburg, Russia) in the field of dilatometric research of solids. The main attention is paid to standard reference materials and standard samples of Thermal Expansion. The paper contains results for wear in conditions of impact between a standard welded and tested specimen realized in the presence of a layer of abrasive particles trailing in the contact zone. It gives an idea about the specifics of this type of wear depending on the impact force and the particle size of the abrasive at various hardness achieved by hard-facing with alloys with different carbon equivalent and a degree of hardening of the layer after the test. Based on an experimental research it was proved that the impact-abrasive wear has its specific features expressed via respective graphical relations. The research was funded by Fund “Scientific Research” at the Ministry of Education and Science of the Republic of Bulgaria. Investigated was the spark plasma sintering (SPS) of β-SiAlON/0–30 wt % BN ceramic composites. The raw materials (β- Si5AlON7 and BN powders) were prepared by infiltration-mediated combustion synthesis (CS). Experimentally established were the following process parameters for SPS of composites with high relative density (>95 %) and flexural strength of 250–300 MPa: (a) heating rate 50 deg/min, (b) maximum temperature 1650–1750°C, (c) and holding time 5 min. The high-strenght complex of the spheroidal graphite cast irons makes them a suitable constructive material, which can compete with the forged carbon and low-alloy steels. In this article it is considered the possibility of using cast details from ductile iron in the railway transport instead of details made from steel.